We always get asked this question. The answer is...YES OF COURSE! Everyone of our treats have been tested in one way or other by our panel of taste testers. Who are they? Our own furkids of course! You can read all about our kids here. Lastly, there is also the baker and her assistants that taste test every single recipe! 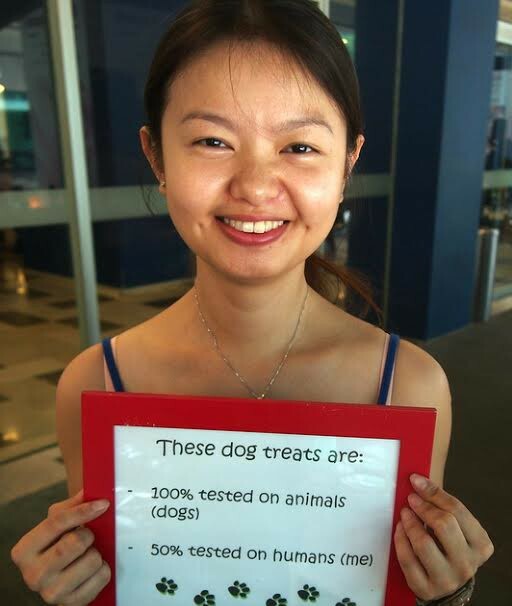 Why do we even test it on ourselves when its meant for the furry creatures? This, is so we can be sure of the texture, the taste and the flavour. How else are we to tell you our Salmon Fudge is has a soft 'fudgy' texture that is full of the taste of salmon with a hint of parsley? Or even how aromatic our Wheat Free Peanut Butter biscuit is because it is made with our own Barking Nuts? In the early days, our petbaker was only willing to test the 'normal' flavours. Which means, anything she'd eat. She refused to test the liver fudge, or Mackerel biscuit, or the Pork Liver Pawffin which are not exactly palatable for our human taste buds (but the dogs and cats sure love it). But now, she has risen up to the challenge and has taste tested every single treat! !